Donald Trump's economic adviser tells the GOP presidential nominee he doesn't spend enough time talking about natural gas and oil development on the campaign trail. "Stress the energy stuff," former Wall Street Journal columnist Stephen Moore said he suggested, as part of a team of four or five advisers drafting lines for the speech Trump delivered to the Detroit Economic Club last month. During the address, Trump unveiled a new version of his plan to revamp America's tax system, promising to "unleash an energy revolution that will bring vast wealth to our economy" and lift restrictions on the sector. 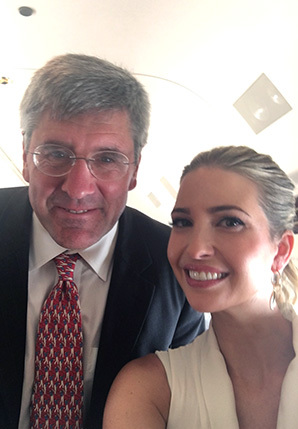 Donald Trump adviser Stephen Moore, shown here with Ivanka Trump, has encouraged the Republican presidential nominee to talk more about fossil fuels on the campaign trail. Photo courtesy of Moore. "We will put our coal miners and steelworkers back to work," Trump pledged. Since Moore came on board this spring to advise Trump on his tax plan, he's been encouraging Trump to hit back against Democrats' claims that the transition to more wind and solar energy will be good for the economy and the environment. "Democrats have bet on the wrong horse," Moore told E&E Daily in a recent sit-down interview. Shutting down oil, gas and coal production, as he claims the left would do, only shifts energy production to Asia and the Middle East. "Every time we shut down a coal plant in the U.S., China builds 10," Moore said. "So how does that reduce global warming?" Some of the concepts in his book, "Fueling Freedom" — co-authored with Texas energy guru Kathleen Hartnett White — crept into the pro-energy development speech Trump delivered earlier this year in Bismarck, N.D. (E&E Daily, May 27). Trump said lifting regulatory restrictions on all sources of energy development could increase federal, state and local tax revenues by almost $6 trillion over four decades. In "Fueling Freedom," the authors estimate the value of untapped oil and gas resources beneath federal lands and waters is at least $50 trillion. That's the "fiscal equivalent of a cure for cancer," according to Moore. Trump could score big with blue-collar workers in regions that support the energy industry by emphasizing the jobs he could create, Moore said. He could draw a contrast with the Obama administration's commitment to the Paris climate agreement, a deal that Moore said "puts America last, not first." "If Republicans play their hand right on this, I think they could really change the political alignment in this country, because Republicans have a great chance of winning over the industrial unions," Moore said. Clean energy boosters in the Republican Party reject the "drill, baby, drill" focus of the plan, favoring investments in technology that could make fossil fuels cleaner (Greenwire, July 22). "Disavowing climate science is a certain path to losing a national election," ConservAmerica President Rob Sisson said in an email. "I suspect Mr. Trump is already doing well among working class voters. If he wants to win in November, he needs to expand his support by appealing to voting blocs not now in his camp." Among key demographic groups where Trump is trailing Democratic nominee Hillary Clinton — college-educated professionals, women, young people and minorities — clean energy is a top priority, Sisson said. But Moore is concerned that the notion of shrinking the "carbon footprint" has become a cultural norm in entertainment, media, academia, law and the regulatory state. Republicans need to be more vocal about the "trade offs" inherent to transitioning away from fossil fuels, he said. Moore is confident entrepreneurs "can figure out ways to reduce carbon emissions other than to shut down American energy." He talked about planting trees to capture carbon. "Why do it the hard way?" Moore said. Fellow Trump adviser Harold Hamm, CEO of Continental Resources Inc., opened Moore's eyes to the oil and gas boom early in the Obama administration. At the time, Moore was still in the newspaper industry, and Hamm's publicist called to pester. "I didn't even know who Harold Hamm was," Moore said. Over lunch at Morton's The Steakhouse, Moore learned how Hamm tapped into new hydraulic fracturing drilling technology to access massive energy deposits in North Dakota's shale fields. Moore later visited the region, where he recalled being "blown away by the technological feat that was happening." The GOP platform reiterates long-standing calls for opening federal resources to oil and gas production, including in the outer continental shelf, while giving authority to state regulators "to manage energy resources on federally controlled public lands within their respective borders" (Greenwire, July 19). Trump raised a few eyebrows among Republicans last month when he told a Denver television station that he supports fracking but believes states should be able to decide whether they want to ban it. In contrast, Moore argues royalty payments, fees and income taxes that states and local governments could collect from the oil and gas industry amount to "easy money" that could be invested in schools, parks or public safety. Moore rejects activists' calls to "keep it in the ground" but says he respects property rights. Clinton and Trump will face off in their first prime-time debate later this month. Moore sees another opportunity for Trump to link energy development to jobs and change the debate on climate change. "The Sierra Club is the big loser if Trump wins," Moore said.